Do you really know what type of body you have? I’ve seen people sweating out in gyms without any clue as to why they are doing certain exercises. Lot of them are in a great cardiovascular shape but their body doesn’t seem to be in desired shape they are working for. You’ll be amazed to know that your body type is related to metabolism and it influences how your body responds to training and diet. That’s where understanding of body shape and body type helps. Body shape is the result of body metabolism. It shows how proportioned you are- top/bottom heavy, hourglass etc. There are 3 basic body types and (arguably) 5 body shapes. Sooner you understand your body type, sooner you’ll be able to put together a workout that makes the most of your body shape. Ectomorphs are usually thin and frail. They have tough time putting on weight, have low body fat adn typically a fast metabolism. I’m talking about a linear body shape, narrow shoulders, waist, hips. Celebrity example – Kate Moss or Cameron Diaz As an ectomorph, your workouts should be short, with heavier weights and less repetitions. Focus on working the big muscle groups: Your quadriceps, chest, back. Limit yourself to 2 exercises per muscle group, 3 sets with 6-8 reps per set with a 60 sec break between sets for recovery. Keep cardio to a minimum and keep it within 50-65% Maximum Heart Rate to improve overall health and recovery. with right cardio balance, you can maintain a lean muscle body. celebrity example- Gabrielle Reese and Jennifer Garner. (MHR) which is fat-burning and endurance zone. With 30 minutes of cardio and a sensible diet you should be able to grow muscles and maintain a lean body. 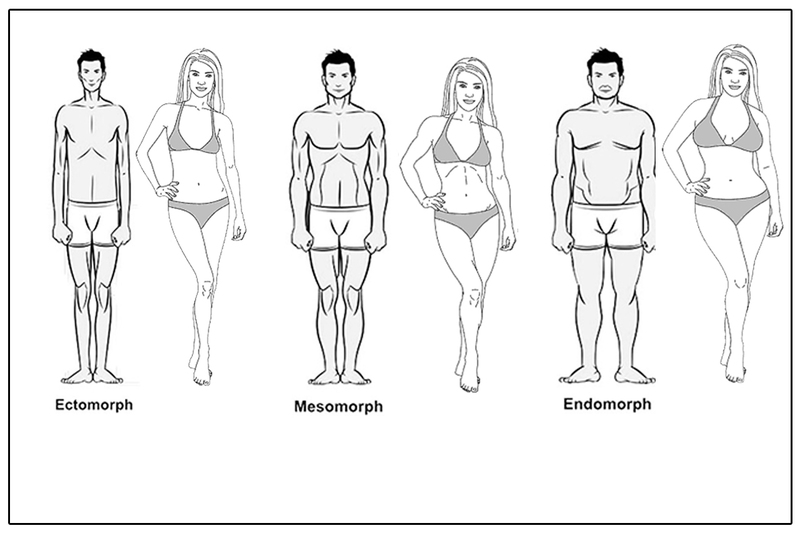 If you are an endomorph, you already know you have a hard time losing body fat and you gain weight easily. You are usually curvy, have a softer and rounder body and have a slow metabolism. While it takes some work to show the sexiness of your curves it is achievable and worth every effort. Celebrity examples- Jennifer Hudson, Oprah or Marilyn Monroe. Endomorphs have a lot of strength and excel in explosive sports. However, your training needs to be against what nature intended for you. In order to lean down, you must focus on endurance type of cardio workouts like- long runs, cycling, swimming with 65-75% MHR. Your weight training sessions should be focused on toning exercises, moving quickly between sets. Think 3-5 sets, 15-20 reps, with short breaks in between. So there you have it, the three basic body types and their characteristics. Before you get started make sure you look at yourself and determine your body type, work through your strengths and weaknesses to achieve some amazing results. Changes won’t happen overnight, they’ll take time but they will be worth-it.